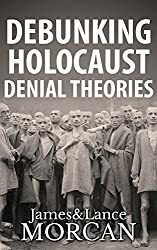 In our new release book DEBUNKING HOLOCAUST DENIAL THEORIES: Two Non-Jews Affirm the Historicity of the Nazi Genocide, we identify those fools who challenge the detailed and indisputable historicity of the Holocaust as people who generally fall into two distinct camps: deniers and the more common revisionists. The deniers, of course, say the entire crime of the Nazis never occurred and is all just a result of post-war propaganda while the more common revisionists try to downgrade the number of Jews killed from six million to as few as 50,000. Jews pictured on arrival at one of the death camps during the Holocaust. Note the revisionists are quick to imply that of the tens of thousands, or the hundreds of thousands, of Jews they acknowledge died, few if any of these “casualties of war” died in the Nazis’ infamous gas chambers. So, essentially revisionists are still denying the historicity of the Holocaust. Clearly, there is very little difference between saying 95% of the Holocaust never happened and saying it never happened at all. For this reason, we only use the term Holocaust deniers as we feel the term Holocaust revisionists gives them far too much respect and makes them sound intellectual or even academic.